Nice little video made by one of the guy's yesterday. Blink & you'll miss me at the start - don't worry in it again later on! Well I've dried out a bit now so it's time for a wee ramble about today's ride. Maybe we can start with the weather - perhaps not the best of conditions when you're hoping for a big group of riders to fill the Rescue Helicopter's coffers but you can't plan on getting a perfect day in the middle of winter. I rolled into Phil Turnbills at about 9:30 to meet with the marshaling crew and after getting my instructions, registering and nabbing some raffle tickets there was plenty of time for looking at bikes and chatting with other riders. By 11ish there was about 60 bikes parked up and registered - time for a Chanccey speech and then it was time to button up for the ride. The marshals headed out first with Bonez & myself following them and leading some of the less experienced riders into town and around the square. After pottering through Saturday morning traffic (and getting thoroughly rained on for our troubles) we headed out of town where we had a quick regroup - curse all those traffic lights and traffic in town. Following the regroup we headed off over the track on very wet roads. Doing as I'd been told I led the group quietly over the track and then through to Mangamire. I soon found out that our noobies weren't so noo and were going great guns in the wet conditions. We then turned onto Highway 2 for a couple of kms before turning at Hamua and heading into the countryside again. We had a nice ride through here and bet the Marshall to one of the corners! Bonez hung around to make sure that nobody took the wrong turn before catching up with me again to led the group into Pahiatua. Out onto the Pahiatua track and then through to Balance we splashed. We pulled up before the Balance bridge to wait for the 2nd group of riders led by Cowboyz & 86. We got there just after it had finished hailing and had to stand around in the rain for 10 minutes or so before the entire group rolled up. After this it was a leisurely ride with the full group riding back into Palmy together and finally stopping in at the Rescue Helicopter hanger for bangers, burgers and coffee. Considering the pretty average weather we had a pretty good turnout and ended up raising around $1,300 for the Helicopter - not too shabby! Worth getting a little wet for. Pinched this link: http://www.motorcyclingblog.com/article/the-fastest-production-motorcycles-in-the-world off Kiwi Biker. Bit out of date - doesn't mention the Connie. Oh, silly me, it's a big fat tourer. Forgot to mention in yesterday's blog - I put $40.15 worth of gas in the bike yesterday! Got a measly 18.86L for my hard earned! And I can remember complaining when $20 wouldn't fill the bike! The plan today was to wash the bike and have a quiet day around home. But with the weather being so nice (shorts & T-shirt sort of a day) it would have been rude not to get out on the bike. I knew that the Manawatu crowd were planning a ride so I made my mind up and headed off to grab some lunch and meet up with them. After a bit of a discussion the plan was set and we headed off over the saddle towards Woodville. As it was an absolute cracker of a day the views for the top of the saddle were fantastic. The only downer was the section of new seal on the way down the Woodville side of the saddle. Once off the saddle we bypassed Woodville by taking a back road and then after rejoining highway 2 for a few hundred metres we headed off the beaten track again on some great back roads to Oringi. This was a very nice section with good roads, good scenery to go with the great weather. After Oringi we headed up highway 2 again towards Danniverke before turning off towards the ranges. Another nice little ride along Top Grass road before tackling the saddle for the second time. From Ashhurst we headed out towards Pohingina and stopped at a cafe for refreshments before heading home via Colyton. Great ride on an absolutely superb winter's day! Totally un-bike related but it's cool! Finally sent of my entry for this year's Grand Challenge. Leave is sorted. Accommodation is sorted. Looks like I'm going then! Went out with a bunch of KiwiBikers to check out the proposed route for the Rescue Helicopter ride coming up on the 28th. It was good see a reasonable bunch of bikers turn up and to check out Menie's new paint job in the flesh. Without giving away the route (not sure how public that is yet) we had a pretty decent ride in good conditions except for an unfortunate incident when a VTR pilot left the road and had a hard landing into a bank. Luckily there were no truly gruesome injuries although he did get a ride to the hospital in an ambulance and is having a pin put into a broken leg. Hope he's up and around as soon as possible. The VTR's a bit second hand but fired up so it could be parked in a farmer's shed before being rescued properly. Not a nice thing to happen and it put a bit of a damper on what was otherwise a pretty nice little ride in the countryside. Hope things go better on the 28th. Not bad at all eh? After missing out on doing the Waioeka Gorge on our way home from the Mini's Return and seriously needing to get out for a decent ride, Mark & I started talking about a one day assault on the Waioeka Gorge. 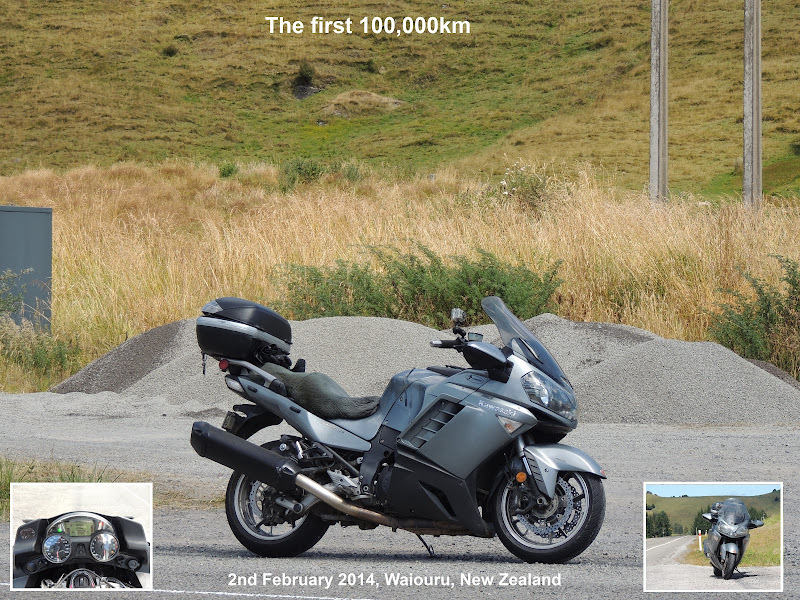 A quick play with Google Maps showed that it was also going to be a 1,003km ride so that was also a bit of a bonus. The only problem was the when: Mark was in the process of selling his house and with the time of year and distance to travel we wanted to try and pick decent weather. in the end we decided to try for Queens Birthday weekend - that gave us 3 days to pick from to hopefully get the good weather we were after. As it turned out we kept a close eye on the forecasts and Saturday looked like the day - date sorted, now to encourage some others. In the end we managed to rope in Brian on his Connie and Chris on his Hoggley Doggley. I hit the hay with the alarm set for 5:30 with the plan being to meet Chris at Ashhurst at around 6:15. In the end I woke up an hour before the alarm went off and got up at 5 and started fluffing around getting ready to go. Just before 6 as my bike was warming up and I was getting ready to put on my helmet this woop, woop noise came up my drive and it was Brian all ready to go - good timing. We quickly headed off towards Mark's and had our first incident: riding along in the dark on Fairs rode I had to swerve quickly to avoid someone's fuel can in the middle of the road. Looking in my mirrors I saw that Brian had seen it too and was pulling a similar move on his horse. Never mind, our timing seemed to be pretty good - as we pulled into Mark's driveway he was coming out - no sense mucking around so off we went. Pulling into Ashhurst it seemed that even Chris had his act together (unusual for him too) and he had beaten us there and already gassed up. The two Connies quickly topped up there tanks and we were out there by about 6:15. No sooner had we hit the gorge and we were plunged into thick fog - no fun in the dark. Naturally the temperature dropped as well - the hot grips got turned up a notch. Never mind we kept trucking on feeling our way through the gorge and into Woodville. Unfortunately the fog stayed low and was to hang around until just north of Norsewood. We pushed on through Fernhill and at the Links Road turn-off we noticed a couple of bikes missing again - and then we saw them go past missing the turn-off. They quickly turned back and yes, the Harley was in difficulties again. They pulled up again and decided that they were going to cut their ride short and head through to Taupo and home so that they didn't keep holding us up. On the road again and it was just Mark and I that head ed out through Napier and onto the Napier-Wairoa. This is a great ride with plenty of windy roads and some nice hilly bits for carving but again we took it pretty quietly due to the temperatures (it was still only around 8:15 when we passed through Bayview) and road conditions. We also hit another bit of fog going through Tutira but nowhere near as bad as earlier on. Coming into Wairoa at 9:30 it was time for fuel for the horses and the riders. We ended up stopping at a very busy cafe and having a quick bite along with a very nice hot coffee. On the road again we left Wairoa and noticed that the temperature was starting to get a bit more friendly the further north we went - no complaints from us. It was another really great ride through to Gisborne - this road is more open than the Napier-Wairoa but has some great hills and corners to negotiate. Awesome riding though still requiring some care on those damp/shady spots. Leaving Gisborne the weather was getting better all the time and we were getting nearer to the objective of our ride - the Waioeka Gorge. The road out of Gisborne starts off with some pretty long and boring straights but pretty soon you start hitting some nice corners and small hilly sections. It was about 30km out of Gisborne where we had a bit of luck - we caught up to a white station wagon and no sooner did we than the driver started flashing his brake lights and gesturing for us to slow down. Ok, so I button off and sat behind him. Around the next corner and here's a van in the grass with some expensive photographic equipment in the back of it. Very lucky! The guy in the wagon got a friendly toot and wave as we passed him. And then hit the picks after coming across 2 cattle - one on either side of the road. Never mind we were starting to get into the really good stuff. After pottering through Matawai you start to get into the Waioeka proper. Great winding roads with bush all around and the river on the left. Best to keep your eyes on the road and enjoy the ride. Once again we had to take a bit of care with the wet roads and there was still frost in the grass in places so it was better to be safe than sorry. Still enjoyed ourselves immensely and only stopped the once for photos just to prove we'd been there. Coming into Opotiki along the big long straight I was lucky again to get stuck behind some cars as we tootled past another radar buddy. By 1pm we were stopped again in Taneatua for some more gas before heading to Rotorua. We swapped bikes for this short leg and it was really hard case being back on a Bandit. The bikes feel very different when you swap from one to another but it was a hoot following my bike for a while and then zapping past on one of the winding roads into Rotorua. We took it pretty quiet through to Rotorua and then onto Turangi as there was a bit of traffic and the road does attract the odd cop. The Desert Road was really nice and for once no cops around. Another stop in Taihape for our last top-up and then home via Vinegar Hill in the dark.